I had this interesting thing in my class yesterday, Business Design. Yeah, I know the name sounds cool but you can't expect that much. "Don't judge a class by its name" is really suitable for all my new classes for this term. Last year was Design Entrepreneurship, but it was changed due the new curriculum. 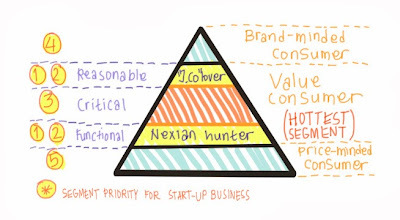 As you can see on the pic above, that's the new pyramid of Consumer 3000. This is not what will happen of the consumer after the year of 3000, but this is the new pyramid of middle-class consumer when a country had reached US$ 3,000 GDP. Some rumor said that Indonesia had reached it, but some of them said not yet. Apparently, this theory was from a book which titled Consumer 3000. But the main idea is the revolution of the middle class. Originally, there were three classes: upper class, middle class, and low class. Now, there are Brand-minded customer, Value customer, and Price-minded customer. Value customer are people who spend one third of their money for "entertainment". They said that many Indonesian middle class have turned into those kind of category. University students are included. I can't say neither good or bad since all this kind of economical theories are always based on the consumerism. The reasonable group are J.Co lover. They will fly on Garuda Indonesia. And they believe, when there's a price, there's quality. They don't mind to spend more money if it's worth. The critical group are the people who wants to get quality and price. They don't wanna spend as much as the 'reasonable' group, but they want to have the quality, or the brand. For example, some students who eat at McD or KFC. Well, they got brands, but the food's there are not so high class. The last one is the functional group. The brand doesn't matter, as long as the function and the looks are the same. That's why Nexian, Advan, Mito etc they choose as the brand of their smartphone. They don't (or can't) spend money to buy iPhone, but as long as it looks like one, and have the same function with Galaxy. And for the start-up business, it is said that it's recommended to try the "reasonable" and "functional" group as the market. For the "reasonable" group, compete on the quality, and as for the "functional" group, focus on the price. In the end, this is just a mere theory.